Ronnie O'Sullivan has been given permission to wear trainers in his second-round match at the English Open. 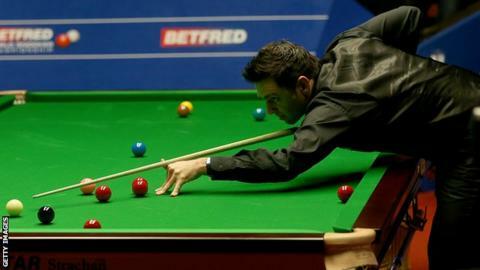 The five-time world champion, 41, beat Zhang Anda 4-1 in the first round in trainers after injuring his ankle. He said he was then told by organisers in Barnsley that he must wear the correct footwear against Mark Davis. But World Snooker said on Wednesday it had exempted him from "standard dress code protocol" to "help manage the effects of an ankle injury". "World Snooker has a dress code for all tournaments, but where players are injured they are given the opportunity to demonstrate medical reasons to show why they cannot adhere to certain parts of the dress code," the statement said. "Each case is dealt with individually. Ronnie O'Sullivan has been given an exemption to use footwear at the English Open which helps manage the effects of an ankle injury." Earlier, O'Sullivan had said on Twitter: "Being told by World Snooker that if I don't wear a black training shoe on Wednesday, I can't play. O'Sullivan then tweeted a picture of his ankle and asked followers to help him find a pair of black trainers.